All County-related bids must be submitted to the County Commissioner’s office, located at 1853 Oakwood Avenue Napoleon, OH 43545. Township bids will be received at the locations designated in their respective legal notices. Please add your company to the plan holders list by clicking the link below and completing the form. If your company is not on the plan holders list, the contract will be awarded at the discretion of the Henry County Commissioners. Also, if your company is not on the plan holders list, you will not be emailed any addendums. All bids must be submitted by Tuesday, January 8th, 2019 at 10:00am. Bid Proposal & Specification Documents– These documents can be obtained by clicking the link or visiting the Henry County Engineer’s office, located at 1823 Oakwood Avenue. If you have not done so already, please add your company to the plan holder list by clicking the “Add My Company to a Plan Holder List” link and completing the form. All bids must be in by Tuesday, March 5th, 2019 at 8:00PM. The Harrison Township Trustees are accepting bids for a paving project. All bids must be in by Thursday, March 7th, 2019 at 10:00AM. 2019 Proposal for Henry County’s reinforced concrete box culverts. This request is for bids to supply and deliver concrete box culverts to be installed by County Forces. The Henry County Engineer’s Office is requesting Construction Inspection and Administration Services for the Henry County Bridge 17c-0.10 Painting Project. The bridge is a four span continuous steel girder with reinforced concrete deck with overall length of 600 feet. The project consists of the complete painting of the structural steel using ODOT’s item 514 Specifications. All letters of Intent must be submitted by March, 4th, 2019 at 4:00PM. Bid Proposal & Specification Documents– These documents can be obtained by clicking on the link or visiting the Henry County Engineer’s Office located at 1823 Oakwood Avenue. 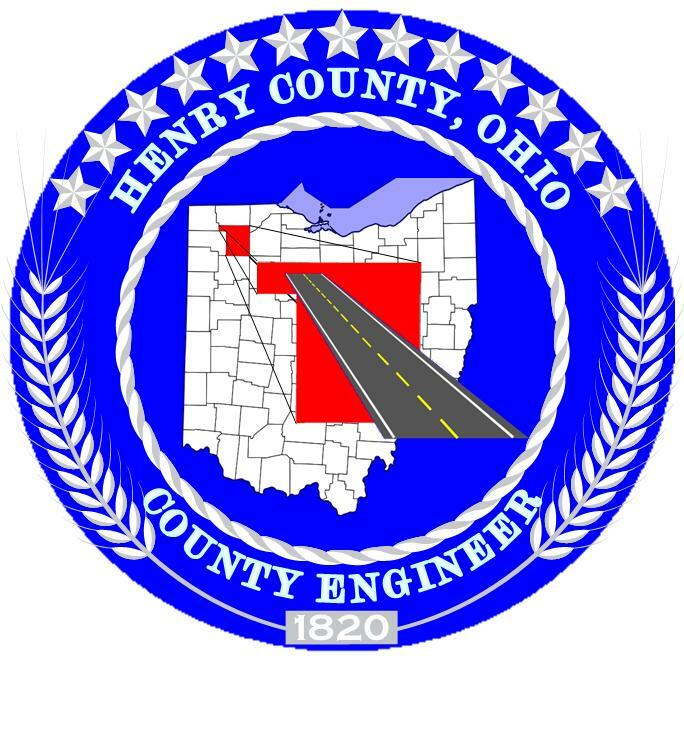 Sealed bids will be received at the Office of the Board of Commissioners of Henry County, Ohio (1853 Oakwood Avenue) until Tuesday, March 12th, 2019 at 10:00AM, at which time and place said bids will be opened and read for the labor, materials and equipment required to paint Henry County Bridge 17c-0.10. Bid Proposal & Specification Documents-These documents can be obtained by clicking on the link, or visiting the Henry County Engineer’s Office located at 1823 Oakwood Avenue. Upon further discussion with ODOT, it has been determined that Item 530: Structure Misc. : Salt Remediation For Structural Steel Painting will not be required for this project. Please use the original plans and drawings for this project when bidding. The only change would be Item 8 Structural Steel Members, Level UF. All bids must be in by Tuesday, April 9th, 2019 at 10:00AM. 2019 Proposal for Henry County’s Prestressed Concrete Box Beams. This request is for bids to supply and deliver Prestressed Concrete Box Beams to be installed by County Forces. All bids must be in by Thursday, April 18th, 2019 at 10:00AM. Accepting bids for 2019 Reflectorized Pavement Markings. Bid Proposal & Specifications Documents– These documents can be obtained by clicking the link, or visiting the Henry County Engineer’s Office, located at 1823 Oakwood Avenue. All bids must be in by Tuesday, April 23rd, 2019 at 10:00AM. Accepting bids for approximately 155,000 gallons of seal coat grade asphalt emulsion (MWS 90). Bid Proposal & Specification Documents– These documents can be obtained by clicking the link, or visiting the Henry County Engineer’s office, located at 1823 Oakwood Avenue. All bids must be submitted by Tuesday, January 9th, 2018 at 10:00am. If you have not done so already, please add your company to the plan holder list, by clicking the “Add My Company to a Plan Holder List” link and complete the form. 2018 Proposal for Henry County’s reinforced concrete box culverts. This request is for bids to supply and deliver concrete box culverts to be installed by County Forces. Accepting bids for 2018 Reflectorized Pavement Markings. Bid Proposal & Specification Documents- These documents can be obtained by clicking the link, or visiting the Henry County Engineer’s office, located at 1823 Oakwood Avenue. All bids must be in by Tuesday, April 24th, 2018 at 10:00AM. Accepting bids for the 2018 Microsurfacing Program. All bids must be in by Tuesday, May 15th, 2018 at 8:00PM. The Harrison Township Trustees are accepting bids for an asphalt patching project. Bid Proposal & Specification Documents– These documents can be obtained by clicking the link , or visiting the Henry County Engineer’s office, located at 1823 Oakwood Avenue. All bids must be in by Monday, June 11th, 2018 at 8:00PM. The Freedom Township Trustees are accepting bids for a pavement repair project. All bids must be in by Tuesday, July 3rd 2018 at 10:15AM. These documents can be obtained by clicking the link, or visiting the Henry County Engineer’s office, located at 1823 Oakwood Avenue. All bids must be in by Tuesday, July 3rd, 2018 at 10:00AM. All bids must be in by Tuesday, July 30th, 2018 at 8:00PM. The Richfield Township Trustees are accepting bids for a chipseal project.